*As the end of my Gear Up year approaches, I needed to spend some time at the District Office with Angela, the business manager, making sure I am not going to go over budget for the year. After working together for over two hours, we finally got it all figured out, and it looks like the Gear Up budget is in good shape. Whew!! *It was POURING down rain when I woke up this morning, so I texted Nikki and said I would rather not walk in the downpour. That means I am making up for lost time at the end of the day around the house, around the backyard, etc. Often I will take the book I am reading and walk around while reading. But at the end of the seventh day of May, I have remained consistent and gotten to 10,000 steps. 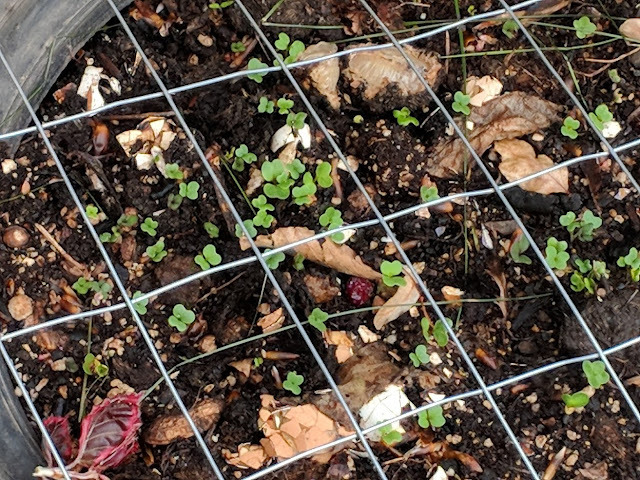 *A couple weeks ago I planted my “Salad Garden” in the old tires along the fence. I am seeing evidence of the planting as little green shoots are bursting forth from the soil!! I can’t wait to have a variety of lettuce and other greens to make salads with each day. *This evening Paul and I gathered together with a group of students and adults in the KHS Cafeteria to rehearse for the Renaissance Dinner that will be Tuesday night. I believe this will be the final dinner sponsored by the KHS Choir Department, under the direction of Joy Persoon. If my calculations are correct, we started with the first dinner back in 2010, and Paul and I have performed as King and Queen for each of the dinners in 2012, 2014, 2016 and now 2018. Five in all. It is a wonderful event, and I look forward to helping entertain tomorrow night with some of my favorite people, including Ken Bartle and his wife Cherri, Carolyn Turner and her husband Gordon, Nate Turner, Keith Mckay, and all the wonderful and talented choir students including Anika Sundstrom, Angelique Teranova, Drake Duce, and Beth Langer.